Purchase 2 copies and save! 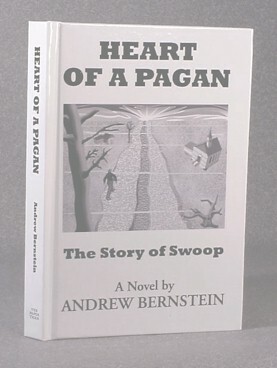 Prodos Interviews Andrew Bernstein: The Scoop on Swoop! What do other readers think of the book? The Ancient Greeks revered and venerated the highest and noblest in their lives. So they built temples to their newly created gods and adorned them with images of god-like men conversing with man-like gods. Andy Bernstein in his new novel "Heart of a Pagan" gives us this Greek conception of a pious man. Like the Greeks, this man doesn't prostrate himself before gods representing the meek and humble, he seeks his reverence and veneration on the sweaty floor of a basketball gym in front of 2,500 people all yelling his name "Swoop! Swoop! Swoop!" Swoop, like the pagan Ancient Greeks, turns his highest ideals -- courage, dedication, heroism-- into objects that should be worshipped and exalted. When Swoop decides to play basketball at a small college in a Christian town the conflict of the novel begins, because as Swoop is fond of saying to these Christians "True services are at the gym." Read this book to see how a truly reverent man can be a complete atheist, yet still pay his highest ideals the reverence due a god.